Free OCR uses the latest Tesseract (v3.01) OCR engine. It includes a Windows installer and It is very simple to use and supports opening multi-page tiff documents, Adobe PDF and fax documents as well as most image types including compressed Tiff's which the Tesseract engine on its own cannot read .It now can scan using Twain and WIA scanning drivers. FreeOCR V4 includes Tesseract V3 which increases accuracy and has page layout analysis so more accurate results can be achieved without using the zone selection tool. 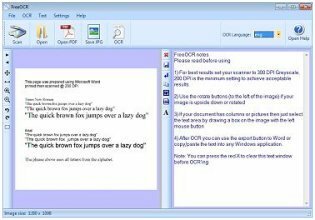 FreeOCR is a freeware OCR & scanning software and you can do what you like with it including commercial use. The included Tesseract OCR engine is distributed under the Apache V2.0 license.